Why not make it a group booking? ‘The more the merrier’ couldn’t be any more of a true statement than for group training and activities in aqua aerobics, exercise, and training for CPR and First Aid. 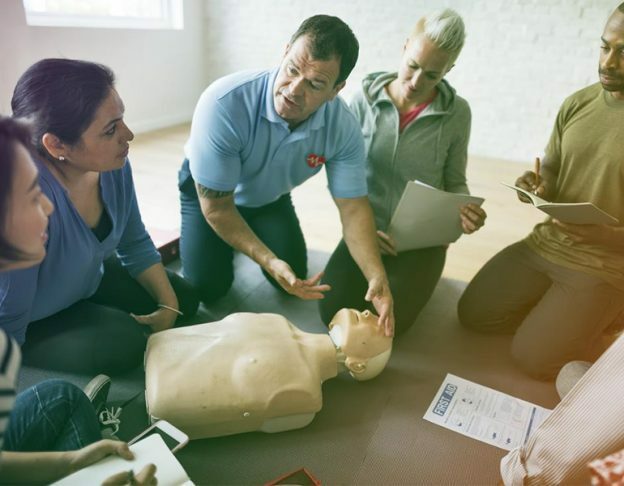 It is seen that often companies and employers provide basic First Aid training and CPR administration training to only a few selected staff. It is highly recommended to include a larger number of audience and trainees. The reason being so is that one needs to be prepared for any unexpected situation or accident. Accidents can happen to anyone at any time in any location. If any of your staff misses out on the training, then they will not be able to respond to a critical emergency situation withproper measures due to lack of training. Situations which include CPR administration and First Aid for a drowning person is a matter of life and death and should not be taken lightly. gets embedded into a person’s brain. A well-trained staff is efficient in spotting potential dangers and sometimes can prevent it from happening as they’re aware of the pre-conditions that lead to such accidents. This results in fewer number of accidents at the workplace and not to mention it may save many lives. One of the most important things to do during emergencies is to have a clarity of mind on what to do. The intense pressure of the situation gets on the nerves and it is important to maintain clarity and act quickly in the proper way. Group training provides people with just that. A sense of self-confidence, responsibility, and good feeling towards the employer is developed because of group training. Group training empowers people and equips them to tackle situations, even if it occurs outside of the workplace. It is a good ice-breaker and deepens the relationship between employees which is good for both them and the organisation they work in. When it is a group booking, we at ATC come to your business place or any other suitable venue as chosen by you and then provide the same training to all trainees, specifically customised for that environment. One of the biggest advantages of group bookings is that it happens in the comfort of the familiar environment for the trainees. We also provide group bookings for sports clubs, organisations, families, businesses and even groups of friends. For group bookings, our experienced trainers come to you to deliver the course in a friendly and educational style. Group training is a good way for all members of your team to learn in a familiar environment and provide ongoing support for each other once the training is complete. So don’t be late and book your group training (applicable only for CPR and First-aid) today by contacting us and we’ll arrange a suitable time, venue, and course to accommodate your training requirements.